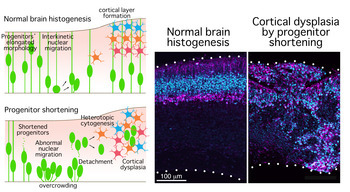 Project Assistant Professor Mayumi Okamoto at Nagoya University Graduate School of Medicine, and her coworkers have discovered that the elongated morphology of neural progenitor cells plays an important role in normal brain development.1 Their paper was published online in Nature Neuroscience on September 22, 2013. Neural progenitor cells undergo cell division in the periventricular space to generate neurons. These neurons then move to the basal surface of brain where they form the neuronal layer and neural circuits. If the neuronal layer is disordered, the structure of the neural circuit is also disrupted, which eventually causes cortical dysplasia. Part of this phenomenon can be explained by the impaired neuronal migration, and some causative genetic mutations that have already been reported. In addition, cortical malformation includes progenitors heterotopia in which progenitors depart abnormally from intact apical surface and generate neurons heterotopically by basal mitosis. However, this mechanism is still unclear. The present paper is the first attempt at explaining why such dysplasia occurs. Assistant Professor Okamoto focused on the elongated morphology of neural progenitor cells. She hypothesized that their morphology enables them to efficiently execute interkinetic nuclear migration and contribute to the formation of normal structure of brain tissue. In the study, her research group induced progenitors shortening and analyzed the movement of their nuclei by time-lapse imaging. The shortened progenitors could not move from the periventricular space to the basal surface, resulted in overcrowded on the periventricular side. Furthermore, these overcrowded progenitors detached from the apical surface and moved in a disorderly manner toward the basal surface. There they divide heterotopically and perturb the structure of the neuronal layer, causing dysplasia of the cerebral tissue structure. In addition, they elucidated that neural progenitor cells' elongated morphology is inherited by one of two daughter cells, whereas the other remains a shortened morphology. The elongated daughter cell moves basally faster than shortened daughter cell, thereby avoiding overcrowding. It is expected that this study will contribute to the understanding of the cause of cortical dysplasia and provide insights about cerebral formation in various species. 1. The research is being promoted by the Ministry of Education, Culture, Sports, Science and Technology as an interdisciplinary joint research project, Cross-talk between moving cells and microenvironment as a basis of emerging order in multicellular system". Assistant Professor Okamoto was intrigued about the various complex forms that single cells generate, and initiated her developmental biology research to elucidate the mechanism of diverse morphogenesis. In particular, neural progenitor cells move dynamically during the cortical development, which eventually generates exquisite adult brain. She aims to discover how collective of cells can develop, maintain, and orchestrate the "cellular society." "I would like to understand the ingenuity of morphogenesis through the detailed observations of single cell and its population." "If you want to understand something or you are wondering about something, you have a great opportunity. Respect your inspiration and give it a try."